The Minister for Finance said SME debt is ‘far down’ the list of concerns in comparison to national debt. 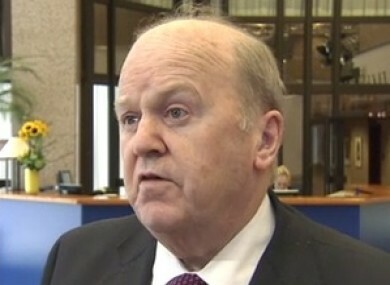 Michael Noonan speaking to reporters in Brussels yesterday. THE MINISTER FOR Finance Michael Noonan acknowledged in Brussels that Ireland has “a lot” of SME debt, but said that it was being “sorted out”. The European Commission’s spring economic forecast highlighted SME debt in Ireland and other countries, stating that legacy debt and impaired access to finance continues to pose risks for SMEs. Speaking to reporters in Brussels yesterday, the minister said he thought that the commission was correct in their analysis, but said that any country coming out of a bailout would have imbalances. “The SMEs are being sorted out. Bank of Ireland say they have over 90 per cent of the SME debt restructured and AIB claim they have 65 per cent restructured so, as far as we’re addressing the legacy debt from the recession, the SMEs would be far down the list,” Noonan said yesterday. In March, leading economist and Professor of Economics at UCD Morgan Kelly warned that when the European Central Bank inspects Irish banks they will find that a significant amount of small and medium businesses have debt issues and they will effectively be wiped out in one go when the European Central Bank “cleans up” Irish banks. Email “Noonan says SME debt is being 'sorted out'”. Feedback on “Noonan says SME debt is being 'sorted out'”.